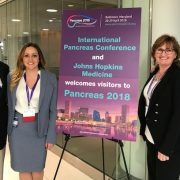 Nikki Mitchell Foundation President Rhonda Miles attended the Pancreas Club Conference in Washington, D.C. to present two awards. 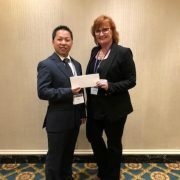 The first was a $20,000 Nikki Mitchell Excellence in Pancreas Cancer Award given to Dr. Jun Yu of Johns Hopkins Hospital. This award ensures Dr. Yu spends a specific amount in the lab, working on the circulating tumor cells as the target of personalized treatment for pancreatic cancer. This project is the same one Nikki Mitchell donated her tumor to through the rapid autopsy program. 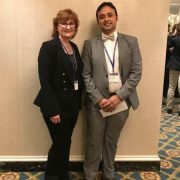 The second award went to Dr. Vrishketan Sethi of the University of Miami, who gave a presentation about the eradication of the gut microbiome reducing pancreatic cancer burden on the immune system. NMF is excited for the opportunity to get our name out in the scientific community. We are committed to returning to the Pancreas Conference in 2019 to give what will now be an annual award. 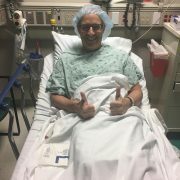 We are excited to partner with the young, creative researchers who’s out-of-the-box thinking we believe will get us one step closer to curing pancreatic cancer.